We had fun in our giant sand box yesterday. 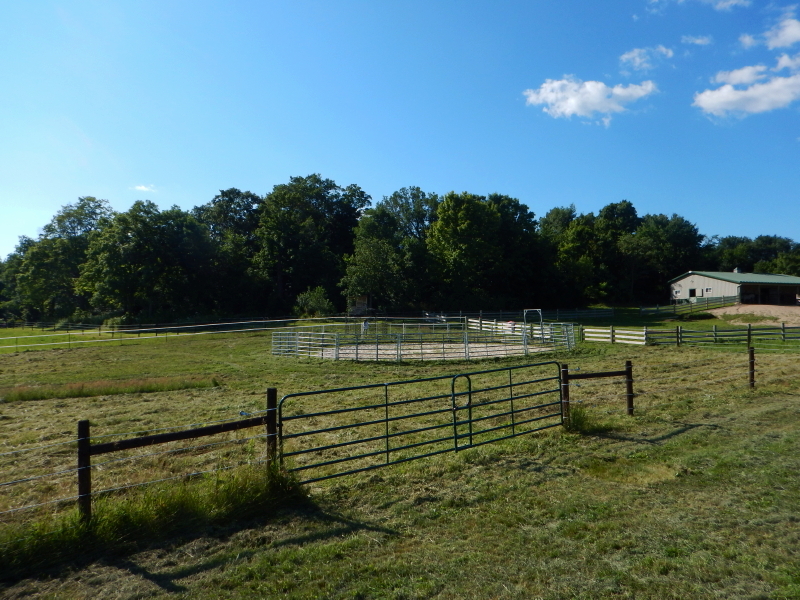 The round pen has not had consistent attention this summer which has given the grass a chance to become a little too prominent a feature. The horses get confused over whether they are supposed to be exercising or eating. The Grizzly and our snazzy ABI grader do a good job of converting the appearance from a look of neglect to one of groomed and ready to go. Separating the uprooted grass bundles from the sand takes a little more manual effort. 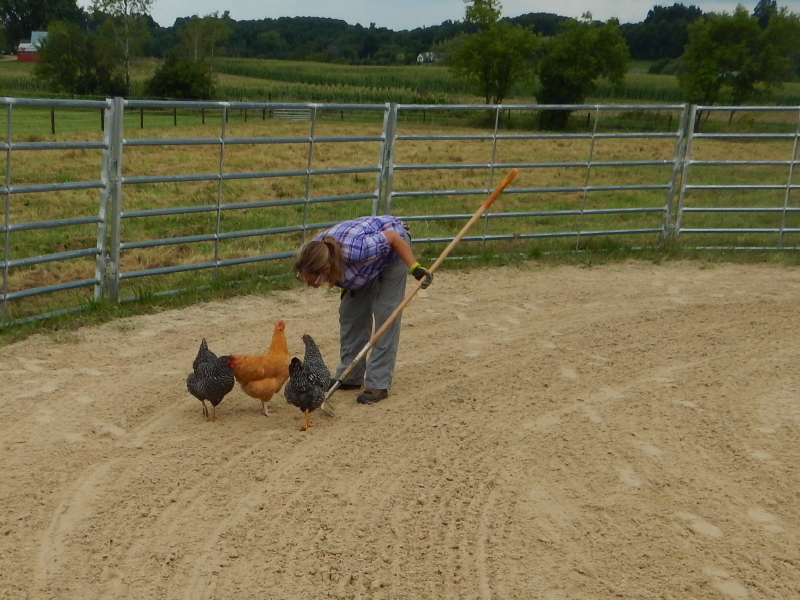 It’s the kind of activity that draws the attention of the chickens, who assume we must be scratching for insects they can eat. Cyndie tried to explain to them that the roots were not worms, but they just stared at her like a bunch of chickens, don’t you know. The gazebo is ready. 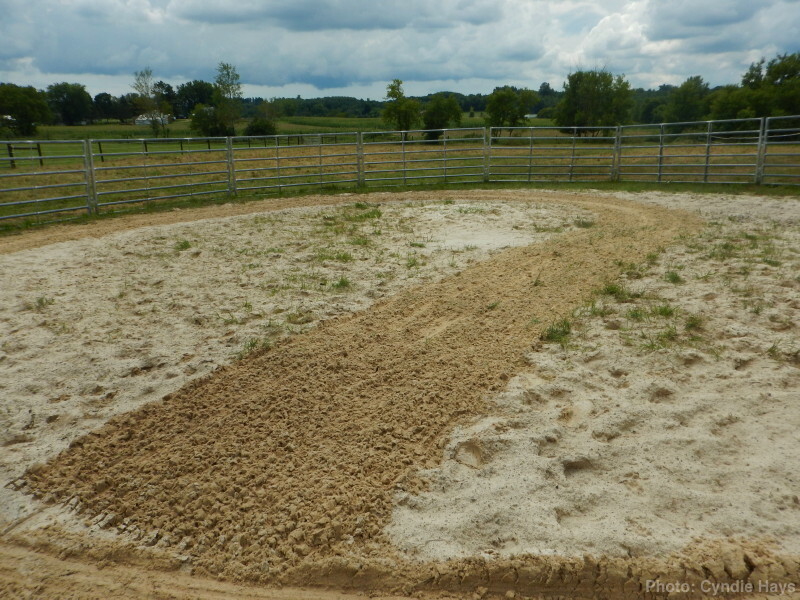 The round pen is ready. We might as well hold some workshops, eh? 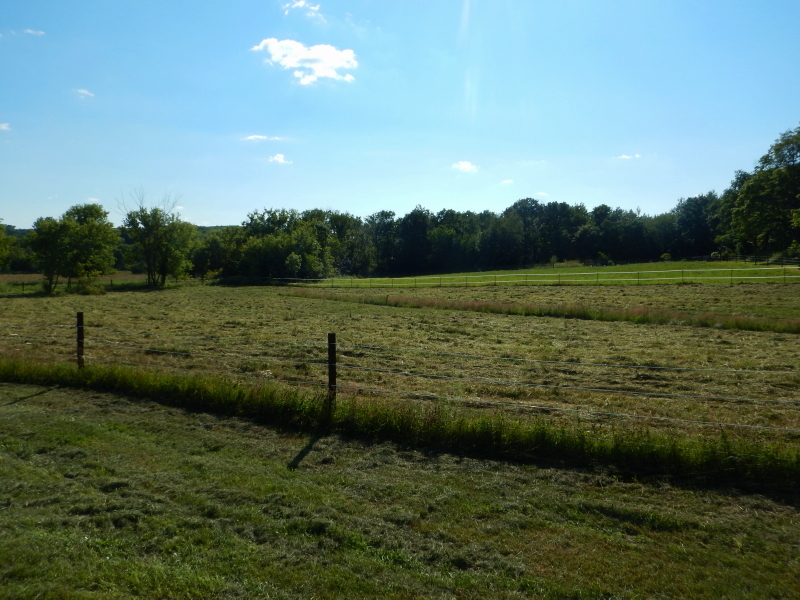 We made visible progress on the grounds yesterday by finally cutting the middle section of pasture that hadn’t been mowed all summer. 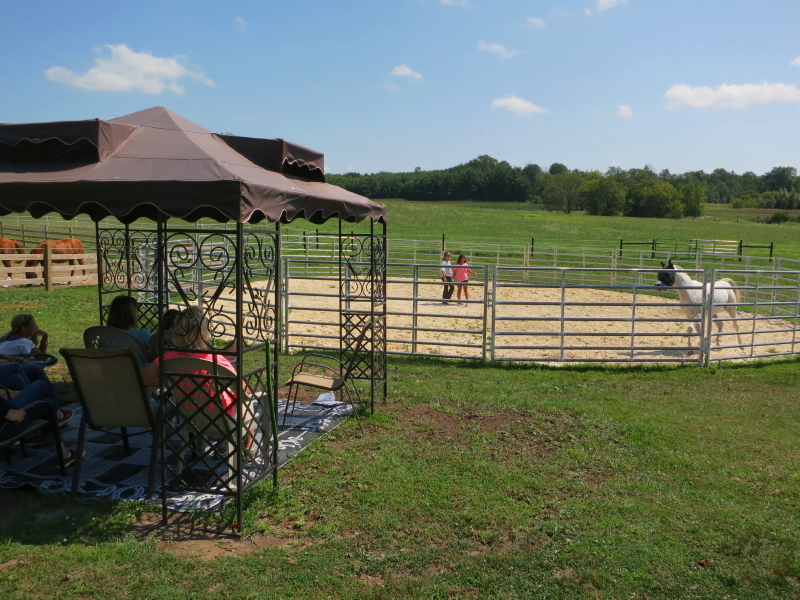 We haven’t even installed the tarp cover of the gazebo next to the round pen yet, which reveals the lack of workshop activity in the early season of 2017. That is changing now. We are cranking up preparations for a shot at accomplishing a summer’s worth of workshops in the final month. The horses have been patiently waiting. I think they are getting excited seeing the increase in maintenance of the grounds. They can tell it’s soon time to do what they do best. Now all we need is people interested in discovering what the horses have to offer. This is what it’s all about. Yesterday we hosted a training session led by Cyndie and Dunia that was the closest thus far to the type of teaching we long ago envisioned happening here. The 3 of us probably experienced as much learning as the people who came to participate in the session. We discovered a few minor details that can be improved upon for subsequent sessions. Happily, the hot and humid weather we are experiencing did not spoil the activities outside involving the horses. Legacy was a rock star endurance athlete during round pen exercises, doing laps with each participant as if it was a comfortable day and each time was his first. The rest of us slowly became fatigued (and we had the shade of the canopy! ), but he showed no signs of having had enough of the work out in the hot sun. It is fascinating to watch how the process works with these lessons. Different people have different things to learn, and the response from the horses changes accordingly. While Legacy was putting on his command performance in the round pen, we experienced a little sideshow of the other horses mixing it up in the paddock, as the newly emboldened Hunter let the other two mares see his change in attitude. With ears pinned back, hooves flew during agitated negotiations over changes in the pecking order that previously existed. Later in the day, after guests had all departed, I wandered down to feed the herd and witnessed Legacy step into the fracas, essentially telling them to put a lid on all the bickering. They don’t question his instructions, but it was cute to see Hunter take up a strategic position on the far side of Dezirea, where he felt safe from reproach, but could still taunt Cayenne that she wasn’t the boss of him. We are going to do it all over again today, with a new group of participants, hopefully in more comfortable weather. 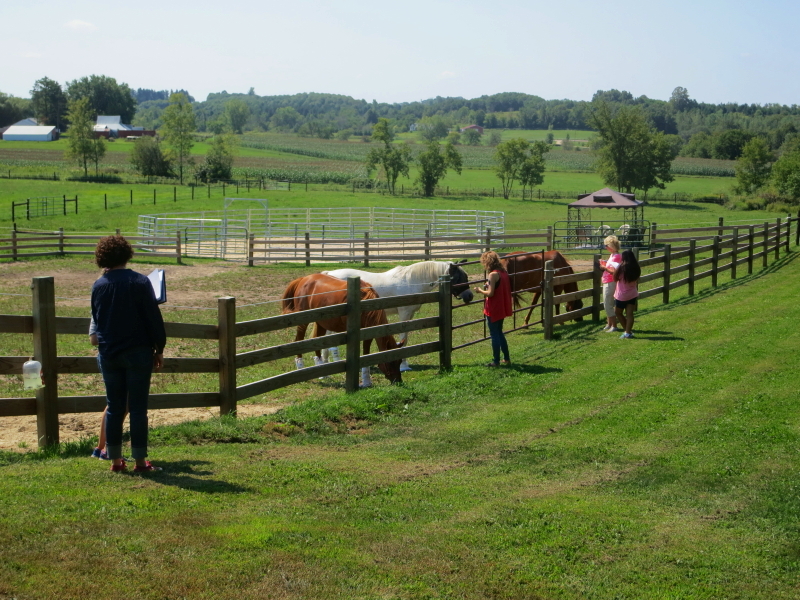 It is incredibly energizing to see this phase of the dream coming to life and witness the horses sharing their wisdom. 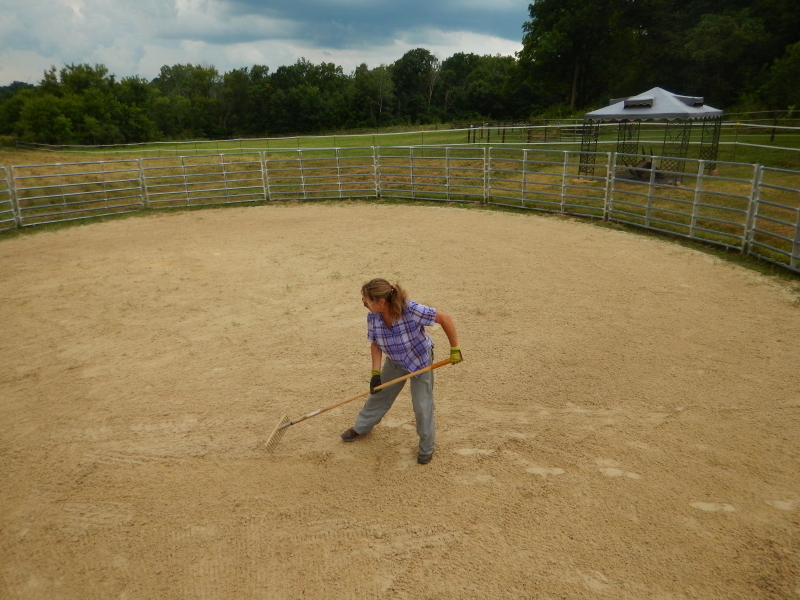 Together, Cyndie and Dunia have put incredible effort toward preparing the horses and making this all happen. I have a sense that, with all the support we have received recently from the Walkers and the Morales family, we are as ready as we’ll ever be to take this to the next level. Lookout world, Wintervale Ranch and Retreat Center is getting ready to go viral. I walked into the sunroom yesterday afternoon, where it is supposed to be sunny and warm in the springtime, and the scene brought out a chuckle. 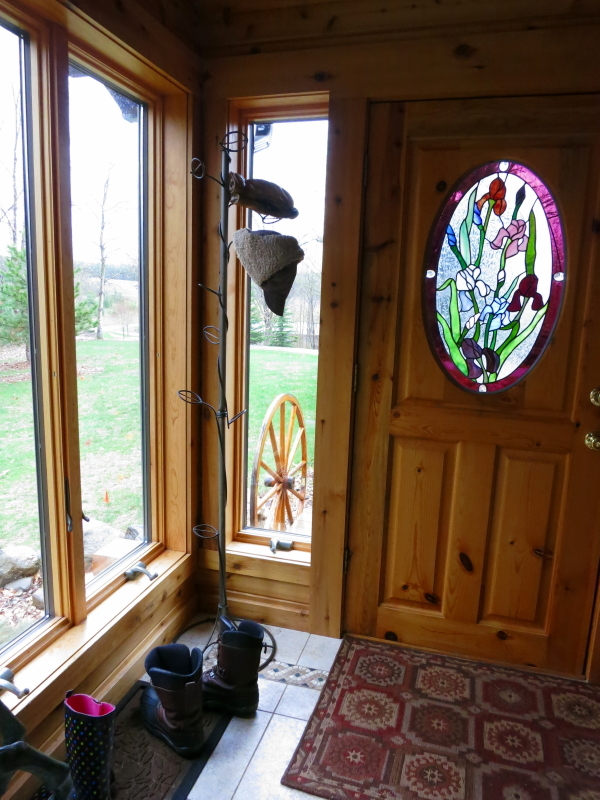 I have removed my winter jacket from the coat tree inside the front door, but something has kept me from finally putting away the boots, hat and mittens, that remain there. Maybe I am waiting for that 2-weeks in a row without snow to fully play out. Hidden in the background of all the projects currently underway at Wintervale, is the work Cyndie has been doing to complete an apprenticeship program with author, Linda Kohanov, to become a practitioner in Eponaquest’s educational model, Equine Facilitated Experiential Learning. Cyndie has been attending workshops, and engaged in lessons and other projects, off and on for over 2 years. On Wednesday, she traveled to Amado, AZ, for the last session, after which she will have completed her apprenticeship. I will be flying down to join her on the second weekend of her 10-days there, to be a member of the first group of students to be trained by this session’s graduating apprentices. It is a very significant milestone on this journey that we launched back when we decided to sell our suburban home and find property suitable for horses. 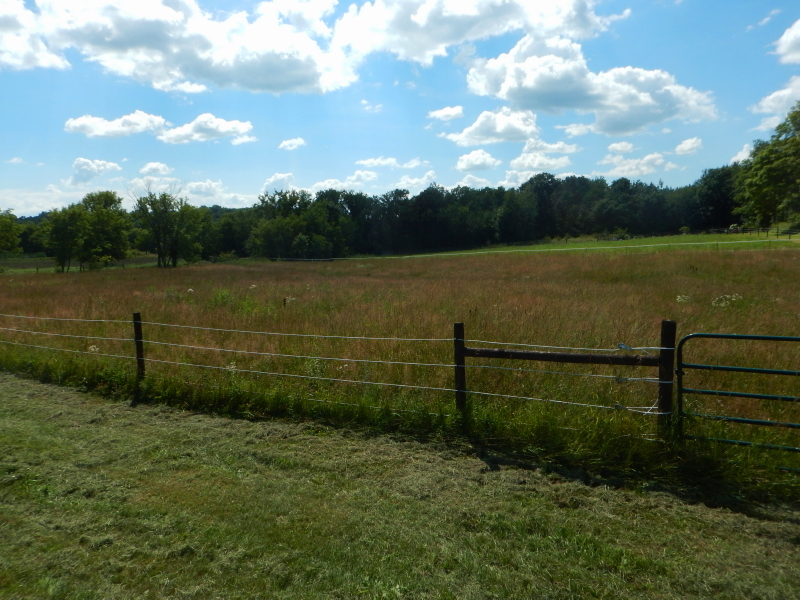 Property that had potential for her to create a place where she hopes to train others. Quite simply, it is why we are here. It feels like a sacred moment. I am looking forward to seeing her in action, in the role she has been envisioning for herself, pretty much since she read Linda’s first book, and then spent time with Ian Rowcliffe and their horses in Portugal. 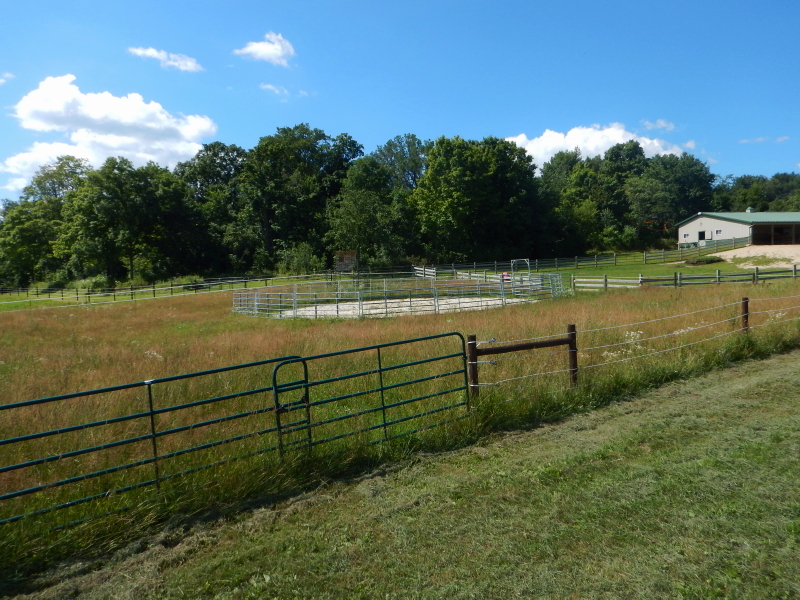 With all the fence work on our property being delayed as much as has happened, some of the most significant progress could end up happening while Cyndie is in Arizona. 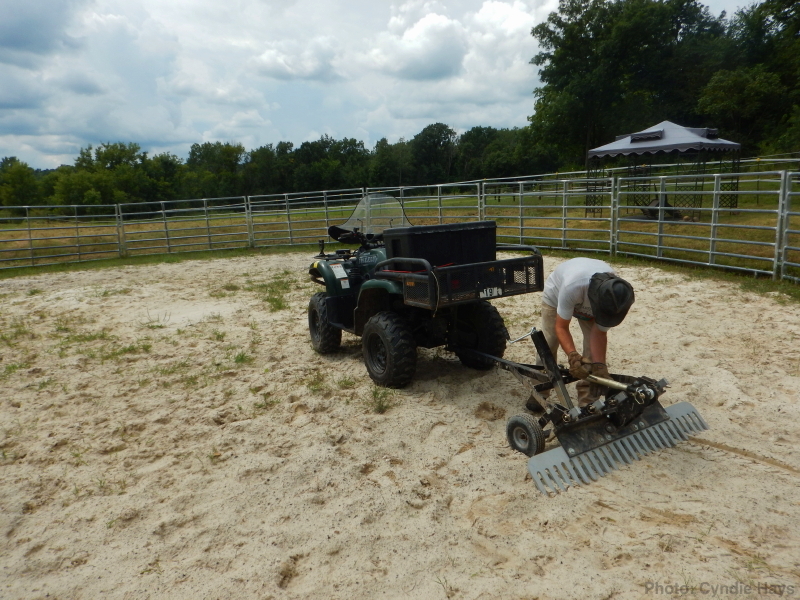 It is setting up to be a close finish of her training and our readiness to finally bring horses onto our property. It adds poignancy to an already special time for us. Let’s hope the weather allows things to work out that way.